Let us guess, you were watching an MLB game and you noticed some hitter with a thing on his hand. (Catcher’s use a different thumb guard). There are a number of places to purchase the Pro Hitter thumb guard. If you are a prime member, then the cheapest place is on Amazon. Otherwise, check eBay or the Pro hitter site directly. A few Google keystrokes later and, baaam, here you are. Short answer: it is a Pro Hitters training aid. It sits between the palm of the top hand and the bat. This device increases the contact with the bat. Many feel the ProHitter gives them more control, better comfort on mishits, and increases their palms contact. 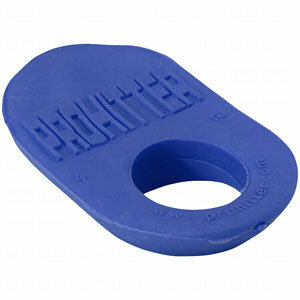 The idea behind the ProHitter thumb guard is to remove the seperation between the hand and barrel knob. This volume filler allows for more consistent pressure on the knob which, in turn, allows for a stronger and more controlled grip. Hard to measure exactly how many use it in the MLB, but no less than 40% of players use it consistently and, likely, well over 70% have tried it. This Prohitter’s batting training aid made our best gifts for baseball players list too. First, the Prohitters Batter Training Aid forces the handle of the bat towards the fingers. The volume of the little plastic piece forces the bat handle out of the palm of the hand and, during the swing, keeps the grip where it needs to be. Second, the Prohitter helps reduce hand sting by taking some of the brunt of the vibration away from the top hand and into the plastic piece. Hitters who suffer from bone and palm bruising will find this a must. Turns out, as you notice, several MLB players use the little gadget. Pro Hitter claims that more than 50% of big leaguers use it consistently. And based on the number of times we notice it on the hands of players we don’t disagree. We at justbatreviews found the little piece to be very helpful—especially for younger players who tend to overgrip the bat and hold it too deep in their palms. The little gadget was simple to use and relatively inexpensive. They even make some youth versions of the Prohitter which might end up a really good baseball stocking stuffer. Prohitter doesn’t release any data as to whether the device actually does improve bat grip or bat speed. However, they do claim, correctly, that well over 50% of Major League ball players take the time and effort to have it on their top hand thumb at every at bat—and in our mind that is as telling as any data points they could provide. Next time you watch a game, see how many Prohitters you can spot – we suspect you’ll be shocked how many you find.